The team encountered the first individual, a beautiful meter-long silvery female, climbing in a Silver Palm tree near the water's edge on a remote island in the southern Bahamas. As dusk approached, Harvard graduate student and team member Nick Herrmann called out on the radio: "Hey, I've got a snake here." The rest of the team came crashing back to his position, and collectively gasped when they saw the boa. Expedition member Dr. Alberto Puente-Rolón, a professor at Universidad Interamericana de Puerto Rico Arecibo and global expert on West Indian Boas, remarked that this animal appeared unlike any species of boa yet known. The group then set about a systematic survey to locate additional animals, turning up four more individuals by the middle of the night. After recording data from these specimens, the team had lain down on the beach to rest until dawn. During the night, as Dr. Reynolds slept, a boa crawled down from the forest, across the beach, and directly onto his head. This caused him to awake with a start, and upon realizing what had happened, he awoke the others to inform them that they had found their sixth animal. After returning to Harvard, the team quickly set about analyzing the data they had collected from the new snakes, including genetic data from tissue samples they had obtained. These analyses demonstrated that this unusual silvery boa was indeed a new species, having diverged from other boas in the last several million years. 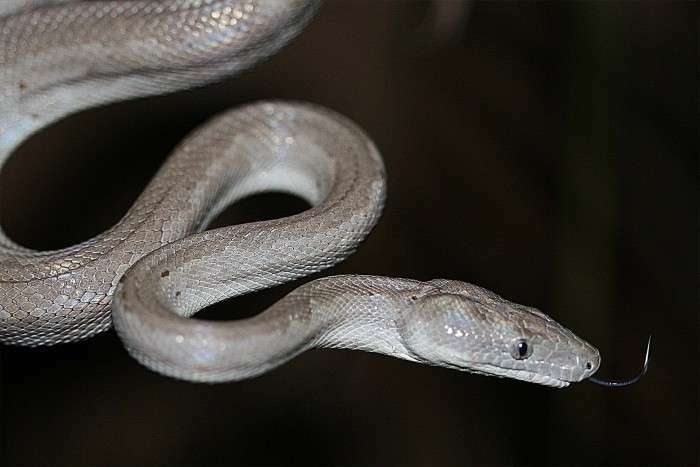 They named it the Silver Boa, Chilabothrus argentum, based on its silver coloration and the first specimen's location in a Silver Palm (Cocothrinax argentata). Dr. Reynolds led a second expedition to the islands in October 2015, directly after Hurricane Joaquin had slammed the Bahamas. That expedition yielded an additional 14 captures despite the hurricane damage and loss of most of the leaves off of the trees. These animals were measured and sampled, as well as permanently marked with internal electronic tags so that they will be easily identifiable. Importantly, the team discovered that feral cats also roam the island, and as major reptile predators their presence is almost certainly threatening these newly discovered boas. Dr. Reynolds and his co-authors have also determined that the Silver Boa is Critically Endangered based on Red List Criteria proposed by the International Union for Conservation of Nature, and hence is one of the most endangered boid snakes globally. Conservation measures are being put into place with the cooperation of local organizations such as the Bahamas National Trust. The hope is to protect these new animals, and to prevent them from going extinct not long after having been discovered. Robert Henderson, Curator of Herpetology Emeritus at the Milwaukee Museum of Natural History, and one of the world's experts on boas, said: "Worldwide, new species of frogs and lizards are being discovered and described with some regularity. New species of snakes, however, are much rarer. Graham Reynolds and his co-authors have not only discovered and described a new species of snake, but even more remarkable, a new species of boa. That's rare, exciting, and newsworthy. The beautiful Bahamian Silver Boa, already possibly critically endangered, reminds us that important discoveries are still waiting to be made, and it provides the people of the Bahamas another reason to be proud of the natural wonders of their island nation. The paper is currently in press at the journal Breviora. Are they sure this is a native species, rather than a 'fancy' cross which has escaped and gone feral ? ?